Props to the stay at home parent! Sounds like some great ideas! Funny enough, our topic at my moms group the other day was making your own cleaning supplies, soap, detergent, etc. I’m getting into it, one because it will save a ton of money, but also because I don’t like the thought of putting tons of chemicals on my kids. I can definitely share if you’d like it. But my main reason for commenting, is because we were discussing essential oils that can be added to soap, shampoo, detergent as fragrance and someone brought up the fact that tea tree oil is bad for young boys. Most of us had never heard that, so one girl googled it and I guess it can disrupt their hormone production. It says lavender can also do the same. Just thought I’d share since you mentioned tea tree oil in the wipes. Thank you!! I will definitely look into the tea tree oil issue for sure. I’d love to know more about what you end up making at home for cleaning supplies and whatnot and what your moms group comes up with! I need to join a moms group – that sounds like fun! Totally doing this! I checked out the link to the quads page and had a panic attack just thinking about what life would be like with two more babies added to the mix. Good grief! haha – I hear you! She is like a super, super mom though. She makes it look easy! I’m glad you’re trying the wipes. Let me know what you think! 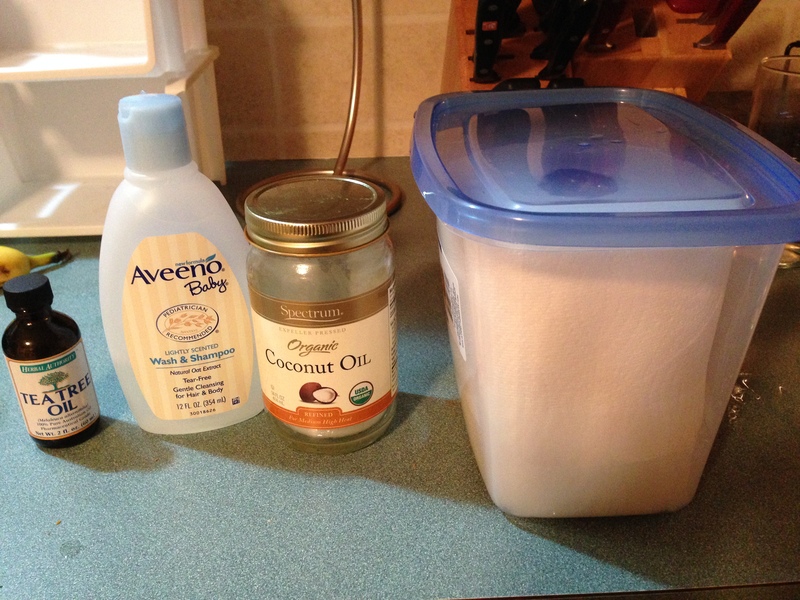 I wanted to say, too, that we took the boys to a naturopath for brutal eczema, and she suggested coconut oil! I think I need to stick with it longer after hearing about your success with it. And there’s another example of something you can do with coconut oil – they keep coming out of the woodwork! I’ve not tried coconut oil yet, but it seems to be all the rage! Thanks for giving me a shout out about the wipes recipe. I haven’t tried anything except Bounty and Viva, but we shop at Costco all the time and would save plenty of money by switching. I actually didn’t know their brand was select a size. Thanks for the tip! Have you tried the DIY laundry detergent? We’ve been making ours since before the babies were born, and its a huge money saver plus not too many chemicals.